Ariel Kachuro/Assistant Photography Editor Redshirt junior Frankie Garcia captured his second dual match of the season against Sacred Heart, earning a 15-2 major victory. The Binghamton wrestling team dominated at Sacred Heart University last Friday, producing a 34-7 result over the Pioneers. 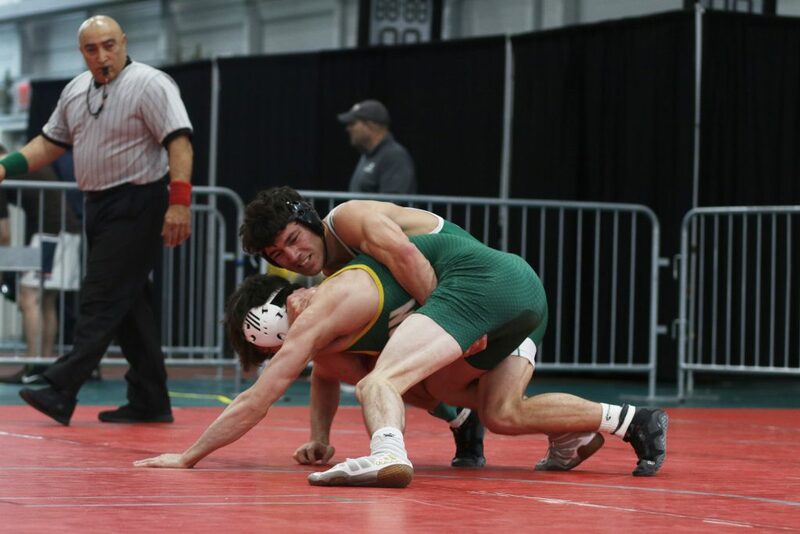 The Bearcats captured their victory wins in a row, bringing them to a 5-3 record on the season with a 5-1 record in the Eastern Intercollegiate Wrestling Association (EIWA). The meet capped off a four-game road trip, which featured stops at Columbia, Harvard and Brown before wrapping up in Fairfield, Connecticut. Having taken eight of 10 bouts, head coach Kyle Borshoff appeared very satisfied with his team’s performance. Redshirt sophomore Audey Ashkar took the first bout by pin, followed by wins for redshirt freshman Zack Trampe and junior Anthony Sparacio that raised the BU lead to 14-0 after the first three bouts. In the 149-pound weight class, redshirt junior Frankie Garcia recorded a major decision against senior Chris Cornell. Winning by large margins was something that the Bearcats emphasized coming into the match, and BU came through with five of their wrestlers defeating opponents by eight points or more. Heavyweight redshirt freshman Joe Doyle put his coach’s words into action, taking a 13-0 major decision over freshman Dante DelBonis. Trampe and Garcia added their own major decisions with 20-4 and 15-2 victories, respectively. Redshirt senior Vincent DePrez made quick work of his opponent, sophomore Joe Eiden, to the tune of a pin within two minutes. After a tumultuous start to the season with losses to Buffalo and Army, the Bearcats continue to cement their standing as a force in the EIWA. Borshoff highlighted the spirit of the team, especially the performance of freshman Christopher Barker. “When the individuals go out, whether they’re winning or losing right now, they continue to inspire their teammates,” Borshoff said. Following a tense first round in which neither wrestler scored, Barker took a 3-0 advantage with a takedown. Pioneers sophomore TJ Calas cut the lead to 3-2 with 1:38 left, but Barker held on for a dramatic first win in a Bearcat singlet. The Bearcats are enjoying success, with five more total meets before the EIWA Championships in early March. They will hope to close out the season successfully, with potential for a 10-3 record heading into the conference tournament. The wrestling team will get to play in front of their home fans for the next two weeks, before finishing up in Ohio. “[We’re] excited to get back to Binghamton next weekend,” Borshoff said. The Bearcats will take on the Hofstra Pride and Drexel Dragons on Sunday, Feb. 10. The doubleheader will begin with Drexel at 2 p.m. at the Events Center in Vestal, New York.